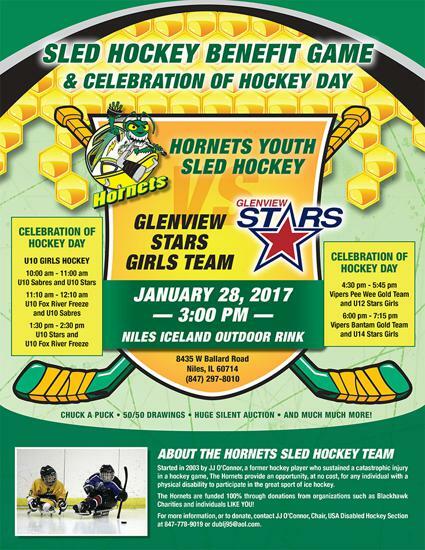 Stars vs. Hornets Sled Hockey at 3 p.m.
Join the Glenview Stars for Celebration of Hockey Day Saturday, Jan. 28 at Niles Iceland Outdoor Rink. The day will feature a game between the Stars and the Hornets Sled Hockey team at 3 p.m. The event is a fund raiser for the Hornets Sled Hockey Organization and all of the games will take place on the Niles Outdoor rink. In addition to several hockey games, there will be an auction, chuck-a-puck and 50/50 raffle. Silent Auction from 2:30-7:45 p.m. featuring items donated by Stars Girls teams. Questions or items to donate for the auction? Please email Lisa Wyngarden using the contact form below.